23a. [Actress Streep playing a centenarian? ], THE OLD GRAY MERYL. Mare. 31a. [Risky business for a compiler of quotations? ], BARTLETT PERIL. Pear. I wouldn’t say “Amy peril” or “Reynaldo peril,” though. Phrase cries out for an apostrophe-S (which wouldn’t fit with the pear variety). 52a. [Alaskan beer container? ], KODIAK BARREL. Bear. 72a. [Promote singer Crow’s music? ], MARKET SHERYL. Share. 104a. [“I can’t help you, but the Brady Bunch mom will be happy to assist”? ], HANDLE WITH CAROL. Care. Another awkwardness—”handle it with Carol” is smoother. 35d. [Frost-covered biochemical solid? ], ICY STEROL. Stare. My pick for the single dullest theme answer this year. I mean, really. Sterol? A biochemical solid? 48d. [Like actor Flynn post-dieting? ], THIN ERROL. Air. Um, that clue calls for an adjectival phrase, but the answer is a noun phrase. Far too many problems with this theme for me to give it a thumbs-up. And I didn’t smile at a single one of the theme answers. What’s the use of a wordplay theme that doesn’t feel playful? 87d. [Little fingers or toes], MINIMI. Certainly not commonly used. With EMILE, LEELA, and ANDERS and that bizarre AMA clue, 86a. [Fitness grp. ], I bet a lot of people floundered around in this corner. Is that AMA the American Medical Association, or some other AMA that has to do with gyms and fitness? 13d. [Product possibly named after a real physician], DR PEPPER. Well! That’s kind of useless trivia. “Possibly,” but who knows? 90a/90d: PRIGS and PRUDES, together again! Cute. 63a. [Typographical no-no], WIDOW. Is this commonly known among people who haven’t worked in publishing and graphic design? Here’s explanatory info on widows and orphans. 97a. [Celsius of the Celsius scale], ANDERS. Anyone watch Workaholics on Comedy Central? There’s a character named Anders. It was hard to find a video clip that didn’t include TV-MA content. This one is all of 17 seconds long. 2.75 stars from me. 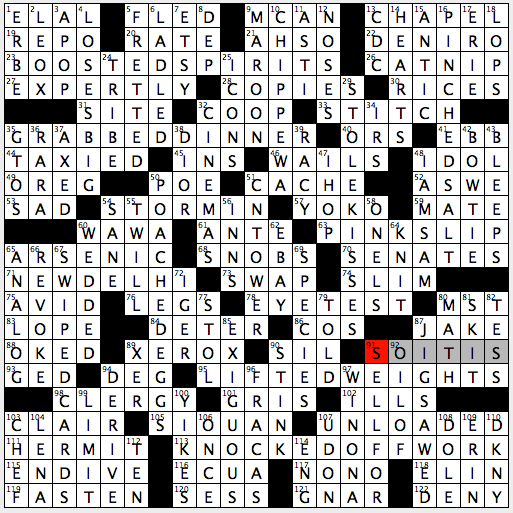 A theme without whimsy in a 21×21 grid with solid but ordinary fill didn’t bring me any solving joy. What a day of puzzles! I’m writing this from NYC after a great day at Lollapuzzoola followed by an evening of trivia. If you live within striking distance of Manhattan and you’ve never been to Lolla, well, you’re missing out. Great puzzles, great people, mediocre snacks. Come next year! Meanwhile, we have Evan’s second themeless Sunday offering to chew on. I suspect it took me a little longer than usual because of puzzle fatigue, and just plain ol’ fatigue. It’s a nice, smooth puzzle with some fun fill. 26a [“Impressed yet, haters?’] = HOW DO YOU LIKE ME NOW. I haven’t seen this in a crossword before and I really liked it. Zippy, in the language, just all-around nifty. 7d [Sauce container] took me a while to parse. When I saw LIQUOR CABINET I giggled a little. We have two cross-references to 7d – 41d [7-down occupant] and 107d [7-down occupants] give us GIN and RYES, respectively. I wouldn’t mix the two. 44d [People who barely move?] are STREAKERS. I grew up in the 70s and I never saw a streaker. I feel cheated. 33d [Cricket world cup event] is a TEST MATCH. This would be a “sports clue makes me feel dumber” moment, with all due respect to Ade (who was at Lolla! So fun to see you!) All I know about cricket is that they use bats and wickets (or at least they use the word wicket) and that the cricket league that met in a park near our Santa Clara house used to roll the lawn with a big hand-pushed roller thingy. 108a gives us a Chekhov quote I haven’t heard before [“Money, like vodka, turns a person into an eccentric.”] Am I the only on who hears “vodka” in that sentence as pronounced by Chekhov on Star Trek TOS? 101a [Welcoming words] = THE MORE THE MERRIER, which is how I feel about this puzzle. I would welcome more. What I didn’t know before I did this puzzle: that a CASBAH is an [Foreign citadel] as clued at 1a. Here’s what that word always conjures up for me. Good morning, everyone! I hope you’re all doing very well on this Sunday. And for those who were at Lollapuzzoola 9 yesterday, I hope you had a great time as I had! I’m sure you did! “Sports will make you smarter” moment of the day: SARAJEVO (59A: [1984 Winter Games site]) – Remember when Scott Hamilton amazed us and won gold for the USA in men’s singles figure skating? Or when Katarina Witt first dazzled us, winning her first of two Olympics gold medals in women’s figure skating? Or when Bill Johnson became the first American to win gold in a downhill skiing event? That all took place in SARAJEVO, the first Olympics ever held in a Communist state and the second ever to be held in a Communist nation (after Moscow in the 1980 Summer Olympics). 23a, BOOSTED SPIRITS [The liquor store thief ___]. 35a, GRABBED DINNER [The restaurant thief ___]. 95a, LIFTED WEIGHTS [The gym thief ___]. 113a, KNOCKED OFF WORK [The art thief ___]. This is the only one that doesn’t work for me. My understanding is that “to knock off” only means “to rob” when followed by a place, as in “to knock off a bank.” The only way KNOCKED OFF WORK would work for this theme is if the clue were something like [The disgruntled desk jockey-turned-thief ___], since “work” would be a place then. Maybe the clue is less literal here than everywhere else, i.e., that “knocked off work” just means that the thief plagiarized the art rather than physically taking it? 16d, PINCHED SALT [The condiment thief ___]. 29d, STOLE KISSES [The chocolate thief ___]. 50d, POACHED EGGS [The poultry thief ___]. 67d, SWIPED CARDS [The casino thief ___]. I enjoyed the theme, and I thought it was executed reasonably well. 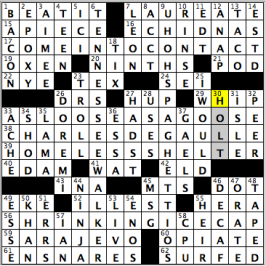 It’s unusual to have four theme answers going across and four down in a Sunday-sized puzzle (so much so that I had trouble finding two of them when I went to write this recap! ), and yet none of the theme answers cross each other, so that was cool. The fill had definite highs and lows. The pros: JIGSAWED, LOSES BIG, EXIGUOUS(! ), CHIPPEWA, PINK SLIP, NEW DELHI, CN TOWER right in the center. Lots of Xs and Ks sprinkled throughout the grid. The cons: ECUA on SESS, MCAN on AH, SO(! ), IGER next to STOL(!! ), RARA crossing OREG, AS WE, OIL OF. So, a mixed bag. That’s all I’ve got re: this puzzle. If you want to solve the beautiful Lollapuzzoola puzzles from this year, you can get them here. But act fast! They’re only available for the next 2 weeks, then they’re gone forever! This entry was posted in Daily Puzzles and tagged Evan Birnholz, Garry Morse, Ian Livengood, Martin Ashwood-Smith. Bookmark the permalink. NYT was a real slog. Worst Sunday in a while. I also thought the way HASTY was clued (“Done quickly”) called for an adverb, but my brain is too mushy from all the forced-sounding theme answers & the obscure SW to know for sure. 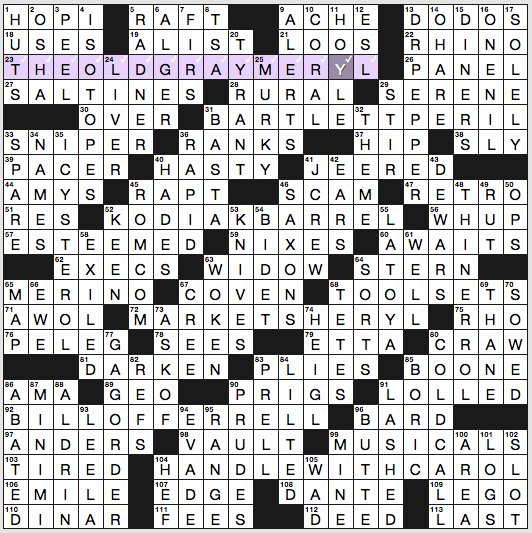 I agree that the Times puzzle is dreadful. Forced theme, real stretchers like AMA as some kind of health organization and whatever MINIMI are, etc. Also feels weird to extend “stuck in a rut” to conclude that getting out of one is idiomatic, and KNIVES as a cost? Ouch. Good stuff was hard to come by in the NYT. Agree with Amy and others that the theme was pretty weak. And that southwest corner should have been sent back for repairs. I did like GAG ORDER and COLD CALL. And I was okay with WIDOW – widows and orphans settings used to be available in all the popular word processing programs (haven’t looked for it in a while – I suspect the default setting is to prevent both). You made me curious. Yep. Still there in Word/Home/Paragraph/Line and Page Breaks. Or Alt+O-P-P if, like me, you refuse to stop using the old keyboard commands. 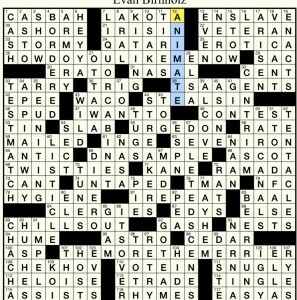 Pretty weak Sunday puzzle, surprised this one made the cut with all the entries I assume the editor has to choose from. Not fun, and the theme is a stretch to say the least. I liked the NYT better than the gang here. I also found it much easier and faster than usual, though I didn’t know LEELA from Futurama or ANDERS Celsius. But what other letter could cross L_ELA and AND_RS, anyway? I was happy I knew EMILE Durkheim, because I had some friends years ago who liked to read him, and that helped with the difficult corner. I agree that it wasn’t that funny a collection of theme answers, but the quickness and variety entertained me. The main fault I found was too many past tense or participle answers with -ed. 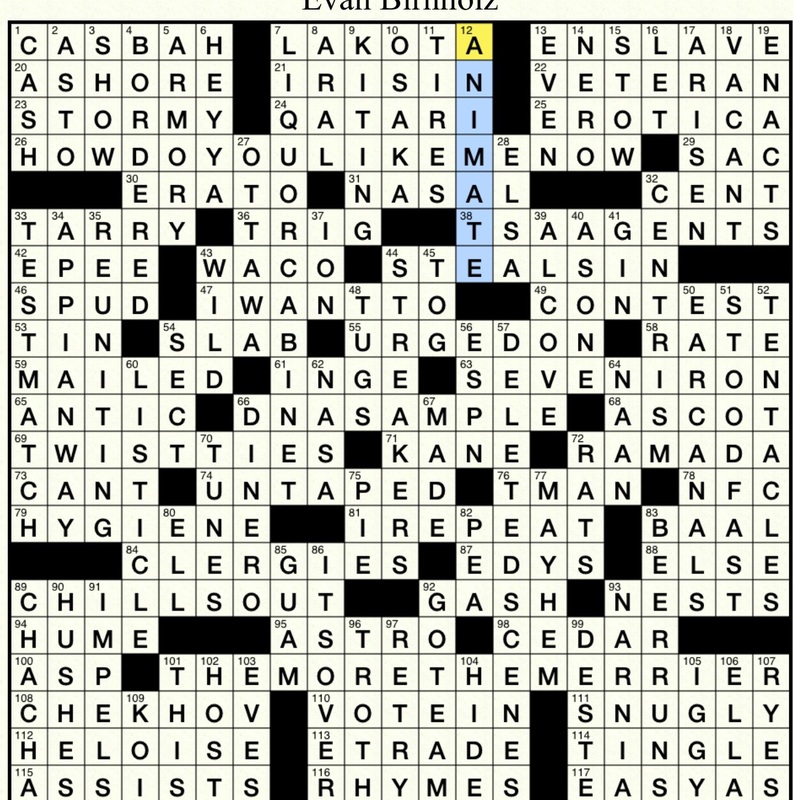 Public Service Announcement (a little late): Folks, if you do the little variety puzzles (like Spelling Bee) in the Sunday Times that were missing this week because of the special issue, you probably know that they are downloadable and available to the general public because they are not where they usually are. 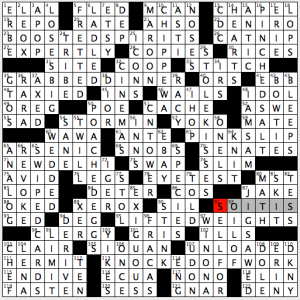 You might not have noticed, however, that the answers to those puzzles are in the printed magazine. I couldn’t find the answers online.